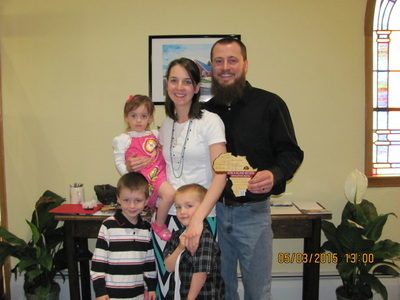 ﻿Jeremiah & Angie & their three children are in Africa on a important mission. They are joining a important project. The Africa Inland Mission. I grew up in the Frostburg area. at the age of 7, my parents divorced and I moved around with family members until my father remarried and we moved to Garrett County, MD when I was 11. When I was 14, I left my father's house to move in with my mother, and I lived with her until she left her second husband. It was at this point, when I was about 18, that God started to pull on my heart. Prior to this point, I had never really heard the name Jesus, and if I did, I didn't care enough to listen. My family was very ungodly and had very loose morals. all the relationships around me were very rough or broken. From age 12 until I was about 18, I spent my life doing what I wanted, with who I wanted, as much as I wanted. My life was an unguided mission for sin in every way. It was okay to me, because that was normal and I thought life had no meaning anyway...we were just what we are and then we die.